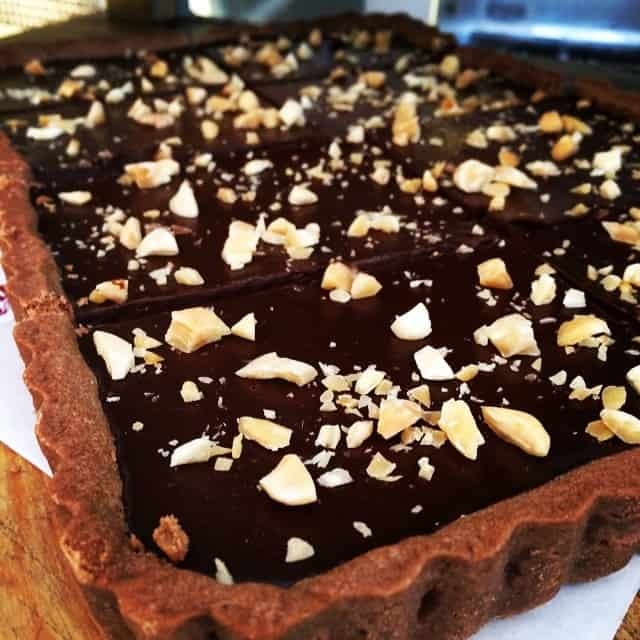 This vegan chocolate tart is a very healthy way for you to enjoy chocolate. Not only because of the health and nutritional benefits of cocoa powder, but also because of the health benefits of coconut oil. The combination of coconut oil and cocoa offers a higher percentage of reducing the risk of heart attacks. You don’t need to use vegan chocolate to make this tart decadent—any bittersweet baking bar will be great. If you like to try this tasty and delicious dessert, here's how to prepare it. Preheat the oven to 350°. Pulse oats, whole wheat flour, agave, cocoa, coconut oil, salt, and cinnamon in a food processor until the oats are coarsely ground and the mixture looks like wet sand. Firmly press into bottom and up the sides of tart pan. Bake crust from 20 to 25 minutes until golden brown and smells toasty. Transfer to a grid and let cool. Dissolve espresso powder in 3/4 cup of very hot water in a food processor. Add the cocoa and let sit for 5 minutes. Add melted chocolate, vanilla, agave syrup, 2/3 cup coconut oil, and 1/4 tsp. kosher salt and process until mixture is very smooth and thick for about 30 seconds. Scrape the filling into cooled tart shell and smooth top (if making tart in a rectangular shell, you may have a little filling left over; save for another use, such as truffles). Tap tart lightly against counter to pop any air bubbles in filling. Cook oats and the remaining 1 tsp. coconut oil in a small skillet over low heat, stirring constantly for about 3 minutes until oats are toasted. Gradually add half of demerara sugar, stirring constantly, until sugar is melted, then remove from heat and stir in remaining demerara sugar just to coat. Season with kosher salt and let oat mixture cool. Spread the oat mixture over tart, sprinkle with sea salt, and let cool until filling is set, at least an hour. Do Ahead: Tart can be made 2 days in advance. Once filling is set, cover and keep chilled.